Do you have trouble with snoring, concentration, daytime sleepiness, or early morning headaches? With help from our friendly and highly-trained pharmacists, you don’t have to suffer anymore! 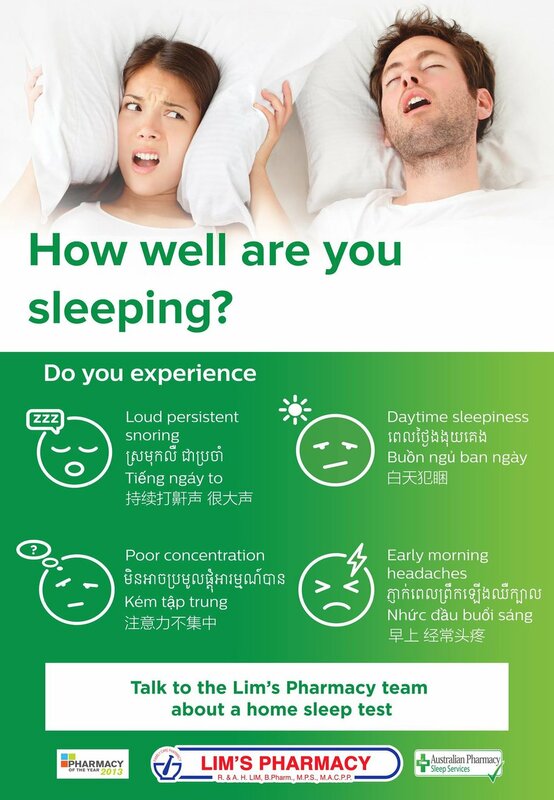 If you experience these symptoms, come in-store and let us know and we’ll be able to diagnose you with a FREE home sleep test device, and then arrange for any recommended treatment. Sleep apnoea, or obstructive sleep apnoea (OSA), happens when a person’s throat is partly or completely blocked while they are asleep. Normally, the muscles that control the upper airway relax during sleep. If they relax too much, the upper airway becomes narrow and people begin to snore. If the airways become too narrow, this may cause breathing difficulties. Sometimes, the airway becomes completely blocked and the person stops breathing. This can last for 10 seconds or more. This is an apnoea. The sufferer is often unaware of it happening, but will wake feeling tired.